New complete ready to run HEI distributor. 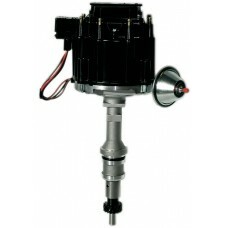 Features a 50,000-volt coil, which produces a 50,000-volt spark through 7,500 rpm. Distributor includes a high-performance timing curve, premium cap with brass terminals, low-saturation ignition module and die cast aluminium housing. Simple wiring makes this a good choice for performance street engines. Distributor has vacuum advance, which can be plugged or changed for adjustable advance canister RUK66952C. Fits Small Block Ford 351W. Installed height 240mm, cap diameter 130mm.